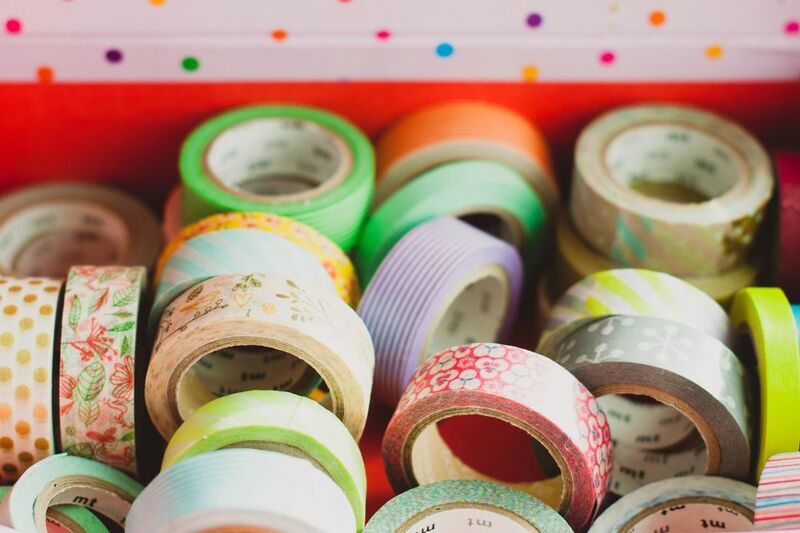 Japanese tape —more commonly known as “washi tape”—has taken the DIY world by storm, spreading like wildfire across Pinterest boards and spawning seemingly endless projects and ideas by clever crafters everywhere. Want to join the fun? Get your hands on some tape, and get sticking with these 10 fabulous washi tape ideas for kids. Photo via Le Jardin de Juliette. Have a case of Matchbox mania on your hands? Instead of shelling out for a big, expensive play table or a printed play rug, why not create your own car course using relatively inexpensive washi tape? You and your kiddo will get a kick out of creating and recreating your own little world together, and when your four-wheeled enthusiast trades in his toys, all you have to do is peel up the tape. Washi Tape Car Track from Le Jardin de Juliette. Simple yet sophisticated, this washi-tape monogram would make an elegant edition to any nursery. Using inexpensive card stock, trace and cut out your letters. Then cover each letter with strips of washi tape, allowing the tape to overlap the sides. Turning the letter over, carefully remove excess tape with a crafting knife. Mount to a second piece of cardstock, and frame. Washi Tape Monogram Art from Lia Griffith. Photo via House on the Way. A picture wall makes for a dramatic and deeply personal focal point for your little one’s room, but finding a large selection of varied and interesting frames can be more difficult than you’d think, especially if you’re working with a small budget. If you want to save yourself some legwork, call off the clearance hunt and buy an inexpensive box set of boring, black frames. Then use washi tape to create your own eclectic designs. Washi Tape Frames from House on the Way. Photo via Life Sweet Life. Does this colorful little end table look familiar? If you’re into crafting, you’ve no doubt run into IKEA’s $7 Lack table before. Here, this inexpensive and highly versatile piece has been transformed using multi-colored strips of washi tape. Simply choose your favorite colors and patterns and stick away! You can easily fend off curious little fingers with a sheet of plexiglass (available at your local hardware store) or a quick coat of Mod Podge. Washi Tape Table Top from Life Sweet Life. Made from chalkboard contact paper and outlined with colorful washi tape, this clever little canvas can be decorated and redecorated to your child’s delight. Simply cut contact paper in the shape of a house. Then use washi tape to create individual rooms. Washi Tape Chalkboard House from Furious Shirley. Photo via Con Botas de Agua. This clever “tape” measure will help you keep track of your little wiggle monster’s growth - if you can catch them! All you need is a tape measure, a roll or two of washi, and a little patience. Washi Tape Growth Chart from Con Botas de Agua. With a little help from a projector, you can create a fun and colorful washi tape silhouette of just about anything! First, project your chosen image onto the wall. Then cover the entire picture with strips of tape. Using a crafting knife, trim all excess tape outside of the image’s outline. Voila! A beautiful wall embellishment for a fraction of the cost of a large vinyl decal! Washi Tape Wall Mural from Deserres. Photo via Live Beauty Full. This simple project is as easy as it is adorable! Trace your child’s hand onto a piece of cardstock. After cutting the hand print out, lay strips of washi tape across it, allowing the tape to overlap the sides. Turn the hand print over, and remove excess tape using a crating knife. Mount your finished piece onto an additional sheet of cardstock and frame. Washi Tape Hand Print from Live Beauty Full.